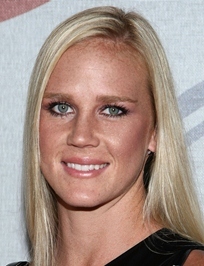 An American mixed martial artist who currently competes in the UFC (Ultimate Fighting Championship), Holly Holm was born on October 17, 1981. Involved in various sports while growing up, she started her professional career in kickboxing but soon moved into boxing where she was involved in total 38 fights out of which she won 33 and lost only 2 while 3 resulted in a draw. During her boxing career, Holly held several welterweight titles and due to her dominating performances, she has been regarded as one of the best female welterweight fighter of all time. Having retired from boxing, Holm started her mixed martial arts career by making her debut in 2011 and after fighting for various promotions, she was signed by Ultimate Fighting Championship (UFC) in mid-2014. Following her UFC debut, Holly Holm won her first two fights by decision before she knocked out the then undefeated fighter Ronda Rousey on November 14, 2015 in order to become the new Bantamweight champion but unfortunately she lost the title to Miesha Tate in her next fight. 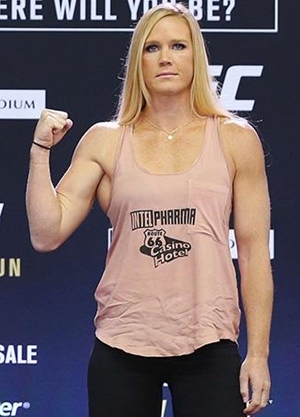 Listed below are the complete mixed martial artist Holly Holm body measurements including her height, weight, shoe, dress, bust, waist, hip and bra cup size. Holm is also a licensed real estate agent. Holly Holm is widely regarded as one of the greatest female boxer’s of all time. Due to her father being a preacher, Holly is often nicknamed “The Preacher’s Daughter”. She became the UFC Women’s Bantamweight Champion in November 2015 when she knocked out the undefeated champion Ronda Rousey.